work has been carried out? We can provide help and advice with regard to building surveys, structural surveys, structural reports, independent valuations, property surveys, engineers reports, specific defects report, home buyers reports or any other property matters . Please free phone 1stAssociated.co.uk on 0800 298 5424 for a friendly chat with one of our surveyors. We survey many properties with structural problems. 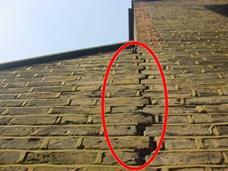 In this case we surveyed a modern property which had had structural cracks. We had been instructed to survey the property by our client a prospective purchaser of the property. The present owners insurance company had removed a tree near the property and carried out remedial work to the property including repointing, replacing bricks externally and the paving slabs around the external of the building, repairing and making good cracking internally and complete redecoration so effectively the problem was hidden . However the insurance company then refused to insure the property when the insurance came up for renewal. Worse than that, they had also passed the data onto the other large insurance companies so they wouldn't insure the property either. We were instructed to survey the property and assess the risk. 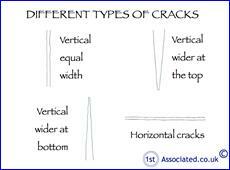 Cracks are one of the key things that we are asked to look out for when carrying out a building survey also known as a structural survey, ranging from hairline cracks through to structural cracks caused by movement. It is not about the size of the crack in a property, it is about the cause. In this case the insurance company had carried out repairs externally and internally so it was difficult to assess the extent of the cracking. A certificate of structural adequacy had been issued but this is not a guarantee. A Certificate of Structural Adequacy is issued to the home owner by the insurance companies appointed Loss Adjuster or Assessor. It normally briefly states the work that has been carried out and then advises what it isn't and also the limitations. A Certificate of Structural Adequacy is not a guarantee or warranty. The only option was that the people buying the property had to go to a specialist insurance company who of course wanted a premium. Generally, insurance requirements with regard to trees have varied over the years and in our opinion have got ever more onerous. We have seen the notifiable distance of a tree away from a property to have been reduced over the years and we would always recommend that you make enquiries with regard to the insurability in relation to trees and other features prior to purchasing a property. Would we have recommended removing the tree ? In our experience the removal of trees that are within influencing distance of a property is what insurance companies regularly do whereas we believe there are other options such as reducing back the size of the tree and then carrying out regular maintenance each year and/or a root barrier put in place. 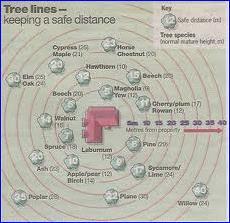 This is the distance in which a tree may be able to cause damage to the subject property. 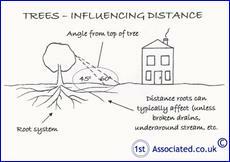 It is not quite as simple as our sketch; it depends on the tree, its maturity, the soil type etc., etc. 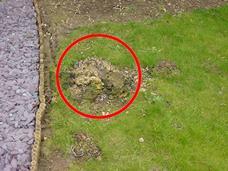 This is an underground barrier that stops the roots from causing damage in a particular area, i.e. 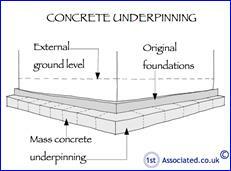 your building's foundations. We would make the general comment that if the soil is clay we wouldn't have removed the tree as heave can be caused and in turn can damage a building. Having said that, in this case we couldn't confirm 100% what the soil was because as far as we could see, no soil samples were taken. Heave is where clay soil expands due to excessive water. Structural problems – are they resolved or are they always with the property? Any property that has had work carried out in relation to a structural claim is blighted and will as we understand it be on insurance company records forever and a day. Will structural problems affect the value of a propert y? Most people would be put off purchasing a property with structural problems and this will be reflected in the open market value. If you are considering purchasing a property with structural problems you should be aware of the likely implications you will have when you come to re-sell the property. A short while after receiving the survey report we had a phone call from the client to thank us for the survey. They advised that it had been a difficult situation as they are very friendly with the people selling the property. They were very pleased that the report was so easily readable and how we carried out additional research with regard to the insurance company's report on the work that had been carried out and how we had spotted that it wasn't just cosmetic work as the people selling the house had said but that they had had some more structural work carried out as well. They thought our report was excellent at explaining the risks that they would be taking on if they did decide to buy the property which they are still uncertain of as they are still weighing up the pros and cons of it. They were also pleased that they had been able to speak to us on the phone and that they had been able to meet the surveyor at the property during the survey. If you have the time available and can get to the property whilst the survey is being carried out our surveyors will be more than happy to talk to you about any concerns and possible problems that you think the property may have together with any potential alterations and improvements that you may be looking to carry out to the property. We will, of course, be happy to speak to you about the survey report once it has been completed. 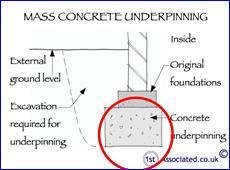 Underpinning is a popular way of resolving problems in clay areas particularly where there are trees and/or underground water in the area. Most people would be put off purchasing a property where underpinning has taken place and we would say that when a property has been underpinned it simply doesn't have the same value as a property that hasn't been underpinned. Prior to purchasing a property which has been underpinned we would recommend your legal advisor checks what information is available in relation to the underpinning. What do the circles and ovals mean in our reports? The red circles are a system that we used within our structural surveys, building surveys and schedules of condition to highlight problem areas so that you are not left wondering what the problem is. If the report, along with our photos, does not explain the problem or characteristics of a property enough then we also have a vast range of sketches that we have had commissioned exclusively for us that we can use in our reports. As surveyors, would we buy the property? A surveyor is often asked the question would you buy the property? The answer is that we may buy the property but it doesn't mean that the people asking us to do the survey should buy the property. We give the example of a property that we bought at auction that took ten years of monitoring before an insurance company would insure it. This wouldn't be the sort of risk that many people would be prepared to take on. You should be aware of the likely implications any structural problems will have when you come to sell the property. Why have an independent building survey? Always have an independent building survey as this will highlight any property problems. Caveat emptor means buyer beware and is why you need to have a building survey to find out if there are any problems within the property; the estate agent certainly will not advise you of any. Remember the building Surveyor that you employ will be the only person working for you with your interests at heart. Once again, we would reiterate that we highly recommend you always make sure when you have a survey you meet your Surveyor at the property. Please feel free to have a look at our website 1stAssociated.co.uk to see for yourself the quality of our website, articles and our Building Survey reports. We pride ourselves on our professional standard and easy to read reports which we have been carrying out for many years on every age, type and style of property across the UK. If you are thinking of buying a property and are interested in having a Structural Survey carried out or if you are trying to sell a property and would like a Pre-Sales Survey please call us on free phone us for a friendly chat on 0800 298 5424. We would be happy to email you several examples of our tailor made reports.